As elegant and sparkling as a freshly cleaned champagne glass, the San Cristobal Tower is a reflection of the world’s finest service at a sumptuous resort. Situated minutes away from the Providencia business district, we are a short distance from the city’s main shopping centers and attractions. With marvelous modern amenities, San Cristobal Tower is an intimate and fascinating destination frequently selected by notables in politics, business and entertainment. Spend a day of recreational fun and relax at our health club, or enjoy the outside beauty of our gardens and magnificent city views. 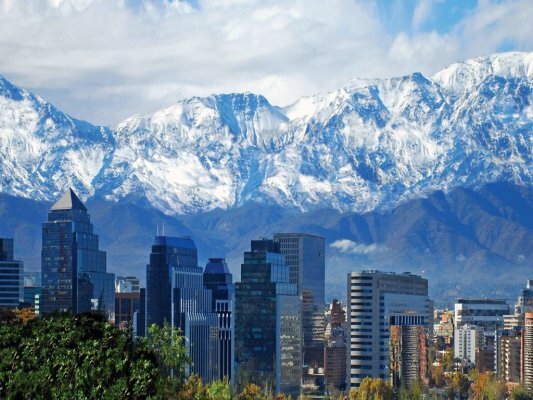 In the morning, the sunrise will greet you with magnanimity at TwentyOne Lounge, which serves a breakfast buffet with an extravagant panoramic view of Santiago and the Andes Mountains from the 21st floor. At night, enjoy the intimate setting of TwentyOne Bar, a modern enclave where you may select your favorite drink or choose from an exquisite anthology of awarded wines. Beautifully-carved mahogany chairs, elegantly-draped curtains, and gold-rimmed mirrors greet you as you open the door of one of our guest rooms. Each of our 139 guest rooms features modern architecture harmoniously combined with classic, elegant décor. Peek behind the curtains and discover a unique view of the snowy tops of the Andes Mountains during the winter. Our exclusive, personalized Butler Service takes care of every last detail in order to ensure your stay is a rewarding one. Each morning you will awake to a complimentary local newspaper, coffee, and juice. The San Cristobal Tower takes pride in fulfilling the international traveler’s every need. Whether you are visiting for business or leisure, we provide contemporary service with traditional hospitality. Many of our services are available round-the-clock, allowing accessibility, flexibility, and convenience. More than half of our team has served the hotel for more than five years and warmly welcomes every guest. Our exclusive, personalized Butler Service takes care of every last detail in order to ensure your stay is a rewarding one. We offer outstanding recreational facilities, including outdoor swimming pools, a lighted tennis court for night games, children’s games, and an exterior deck to enjoy sunsets. Our hotel is adjacent to the Sheraton Santiago Hotel and Convention Center, where a modern fitness facility is equipped with the latest in equipment and accessories for the ultimate workout, including a splendid indoor heated swimming pool. The art of relaxation takes on new meaning with our spa. Discover personal attention and therapeutic indulgence for mind, body, and soul. A functional Business Center has been conceived to meet all your demands. Its modern workstations, technology, and highly-trained personnel will grant the support you need to do business. The elegance of the San Cristobal Tower takes on many different forms to fully satisfy your every whim. From private dining to personalized banqueting and conference lunches, our flexible tailor-made service will suit every individual need. A dedicated conference organizer is available to ensure that practical and technical needs are met. Conference equipment such as video conferencing, wireless High Speed Internet Access, and other audiovisual requirements can be arranged. Meetings, cocktails, and private events will flourish in the atmosphere provided by any of our three exclusive boardrooms. These meeting venues are located in the business center and the TwentyOne Lounge, overlooking the city on the 21st floor. The capacity of our meeting facilities varies according to the meeting space set-up. In addition, we are located adjacent to our sister hotel, the Sheraton Santiago Hotel and Convention Center, providing additional access to their meeting and convention facilities. They offer 15 fully-equipped meeting rooms, including video conferencing, wireless High Speed Internet Access, and other high-end audiovisual requirements, to suit any particular need. San Cristobal Tower offers a unique view of the snowy tops of the Andes Mountains during the winter season. Modern architecture is harmonically combined with the classic and elegant décor of our splendid guest rooms. Our 127 45-square meter Grand Deluxe Rooms are completely equipped with a minibar, complimentary mineral water, wireless High Speed Internet Access, Hi-Fi system with CD, automatic air conditioning system, in-room electronic safe with storage capacity for your laptop computer, and much more. Fax machines and cell phones are available upon request. 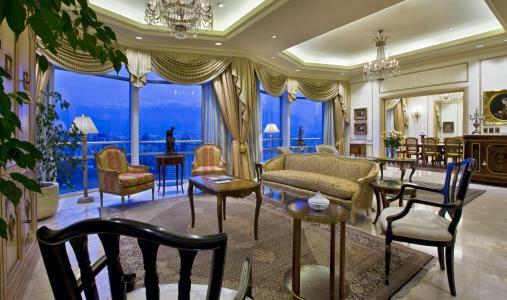 You will be personally attended to by an exclusive butler service which is available on every floor. There are also rooms specially designated for smokers. The nine 90-square meter Executive Suites are two-section rooms with astonishing views of Chile and the majestic Andes Mountains. Decorated in an English style, each offers a separate living room, dining room, and large working desk equipped with direct-dial, two-line phones, wireless High Speed Internet Access, and a fax machines upon request. Our two elegant Terrace Suites are named after the great Literature Nobel Prize winners from Chile, Gabriela Mistral and Pablo Neruda. 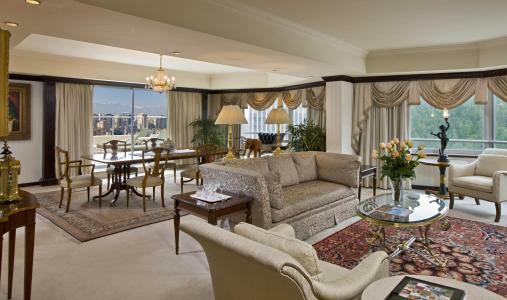 These 135-square meter suites feature spacious terraces, which boast spectacular views of the city and Andes Mountains. Each offers a separate living room, dining room, bedroom, and bathroom with separate Jacuzzi, creating a spacious atmosphere to work and rest. The delicate features and elegant details range from fine French crystal ware to collection furniture. Our sumptuous 350-square meter Presidential Suite, located on the 22nd floor, offers a unique and uninterrupted panoramic view of San Cristobal Hill, the Mapocho River, the Andes Mountains, and downtown Santiago. Its interior combines the excellence of style and comfort, decorated with fine furniture from England and antiques from Buenos Aires. Rooms include a magnificent marble bathroom with Jacuzzi, separate living room and dining room, fully equipped kitchen with an exclusive butler, and a work studio with all the comfort of a small office, including a fax, two telephone lines, wireless High Speed Internet Access, and a computer. Cellular phones are also available upon request. TwentyOne Bar & Lounge, located on the 21st floor, provides a sumptuous panoramic view of Santiago and the Andes Mountains. Paying homage to English tradition, it offers breakfast service including pastries, cookies, scones, sweet marmalades, delicious sandwiches, and coffee. Every evening, discover our new bar concept to enjoy your favorite cocktails, a fine selection of Chilean and international wines, music, and an unforgettable ambience. Delight a private party with the most beautiful landscape, featuring the best sights of Santiago and The Andes. An intimate gathering, dinner, or cocktail party may be accommodated with style and first-class service in the new TwentyOne Lounge area. In addition, we are located adjacent to our sister hotel, the Sheraton Santiago Hotel and Convention Center, providing additional access to their elegant El Cid Restaurant, seasonal outdoor grill El Bohio, and casual El Jardin Coffee Shop.